Pounded Yam is one of the most loved Nigerian fufu meals. It's posh to say that of all the Nigerian fufu meals, you eat only pounded yam because yam is expensive. But to pound the yam the traditional way with mortar and pestle takes a lot of energy and sweat. So if you have a stand mixer, it's time for you to rest and transfer the job to your stand mixer by using it to make pounded yam. If you do not have a stand mixer, you can also make the pounded yam with a food processor and a blender. Click here for details. White Puna Yam. Click here to see what it looks like or watch the video below. And to make the pounded yam with a stand mixer you will need a stand mixer, of course. 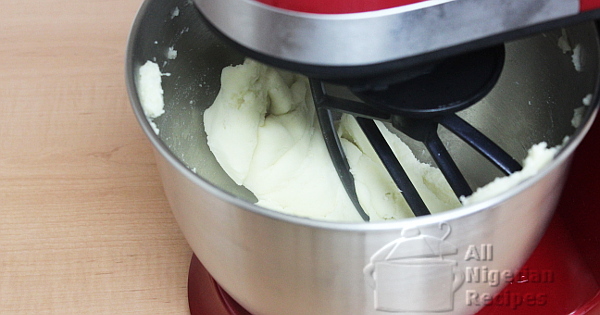 If you do not have a stand mixer, click here for how to make pounded yam with a blender. Tip: Use the middle of yam because it gives you the pounded yam with the best consistency. Watch the video below to see me explain how that works. This is unbelievably so easy to make! Cook till the yams are well done. Two signs of a well done yam for making the perfect pounded yam are: the surrounding water will be cloudy and slightly soupy and it is very easy to drive a knife into the pieces of yam. Those read like three signs though hahaha. Once you are happy, decant the water and set aside because you will need it later. Put the cooked pieces of yam into the bowl of your stand mixer and using the beater attachment, whip the pieces of yam till a smooth dough is formed. I usually start with a low speed then slowly increase to high speed. In about one minute, you will see a smooth pounded yam. Watch the video below to see this in action. If you want the pounded yam softer, add some of the soupy water from cooking the yam and whip some more. Keep doing this bit by bit till you get the consistency of pounded yam you want. Be careful so it does not become too soft. Pounded Yam is best served immediately after preparation because it becomes soft and loses its elasticity over time. Serve with your favourite Nigerian Soup. Click here for all Nigerian Soups. Some people like Pounded Yam and Egusi Soup combo while some like Pounded Yam and Nsala Soup combo.